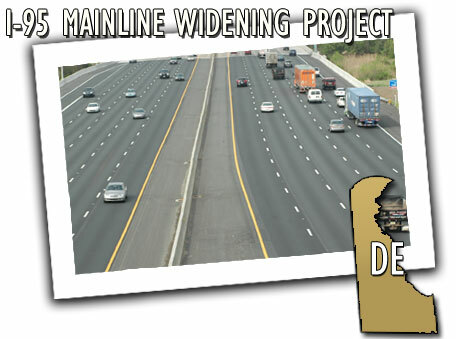 The I-95 Mainline Widening Project is part of a multi-year, multi-phase turnpike improvement program led by the Delaware Department of Transportation (DelDOT). The four-mile widening project to add a fifth lane in each direction was a challenge, due to the volume of traffic and number of highways that converge at one point, including I-95, I-295, and I-495. Nearly 230,000 vehicles use this eight-lane section each day with no real alternative routes. The corridor is the lifeline for east coast travel, transport of goods and services, commerce, recreation and tourism. Using a team that included several consultants and the Federal Highway Administration (FHWA), the project began an aggressive 18-month schedule using a comprehensive Critical Path Method (CPM) as the key management tool. Outreach and communications to the public included immediate traffic updates on the radio, website and through an in-house radio station. DelDOT created a master list of legislators, organizations, businesses, hospitals, colleges and other interested particles that were contacted immediately if there were lane closures or detours. DelDOT also worked with major travel organizations such as AAA, Motor Freight Services and MapQuest. Safety was also critical. As a result of close cooperation with the Delaware State Police, no fatalities occurred during this project. In 544 calendar days, DelDOT and its contractors were able to widen the corridor without closing any lanes during peak hours, while minimizing impacts to all adjacent wetlands, ensuring safety to the traveling public and workers, and finishing in half the time of the advertised schedule.